L'opération "Oyster" - La flamme de la résistance ne doit pas s'éteindre et ne s'éteindra pas! 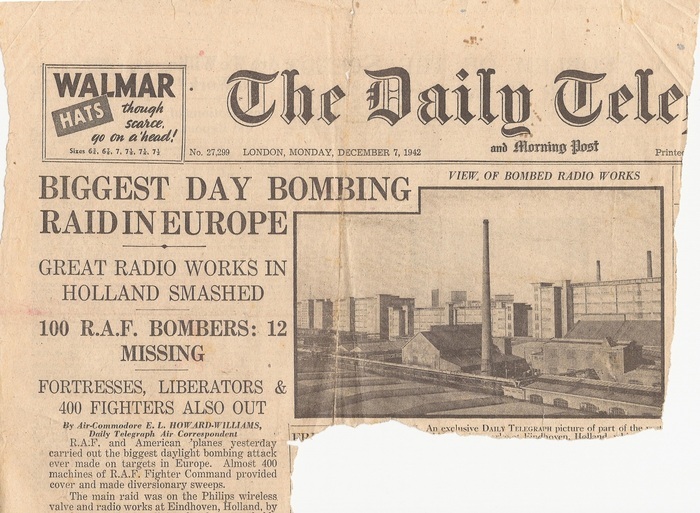 The objective was the Philips factory in Eindhoven producing parts and lamps for the German radars. 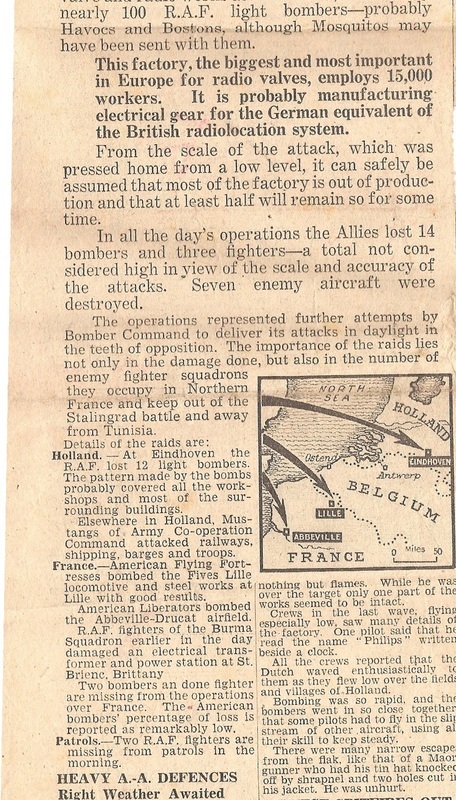 This daylight and hedge hopping raid , was very murderous, 13 planes shoot down , 41 airmen killed and 4 POW. 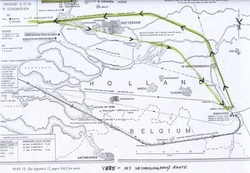 There were two main targets, Stijp and Emmasingel,the two different sites were totally destroyed. 16 Venturas - 3 planes shootdown , 12 airmen killed. Pilot F/S A.G.Peterson †, navigator Sgt. E.J.F. Vick †, WO/AG Sgt. S.J. Isaac †, AG Sgt.P.J. Stokes †. F.E/ King †, WO/G Sgt. T.M. Richings †. Pilot F/S J.L. Greening † , navigator Sgt. E.C. Mowforth †, WO/AG Sgt. D.H. Harries †, AG Sgt. B.H. Thomas †. 16 Venturas - 2 planes shootdown , 5 airmen killed . navigator Sgt. R.C. Lamerton †. Sgt. W.P.Gregory †, WO/AG Sgt. A.T. Milton †. 12 Bostons - 3 planes shootdown ,11 airmen killed . Pilot Sgt. C.A. Maw †, navigator F/S H.E. Wilson †, WO/AG Sgt. R.A. Barnes †. 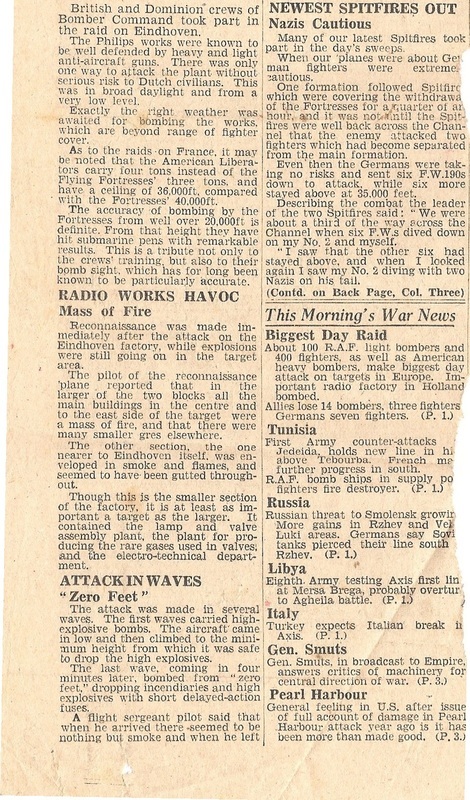 navigator F/O D.R. Redbourn †. WO/AG F/L R.W. McCarthy †, WO/AG P/O M.L. Delanchy†. 3 Mosquitos -1 plane shootdown , 2 airmen killed . Pilot F/O J.E.O'Grady † , navigator Sgt. G.W.Lewis †. 12 Bostons -1 plane shotdown , 3 airmen killed . Pilote F/O N.J.A Paton † , navigator F/L J.G.A.Maguire †, radio/mitrailleur P/O J.L.Fletcher †. 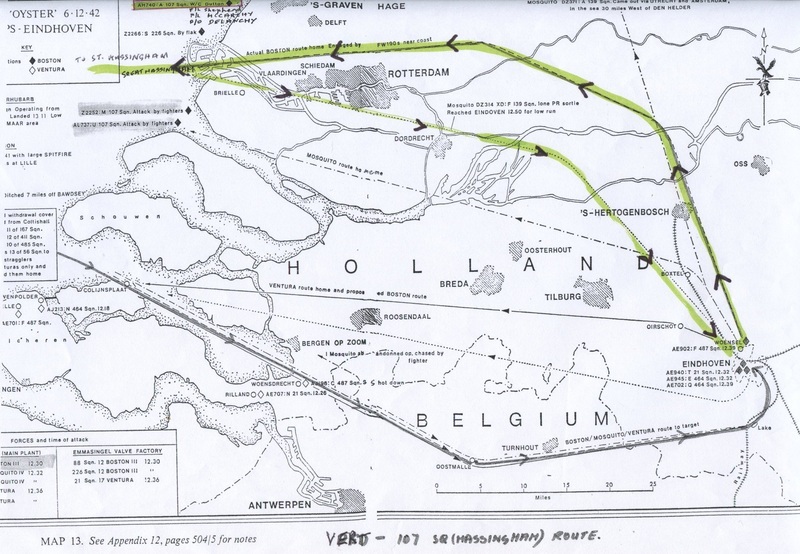 14 Venturas - 3 planes shootdown , 8 airmen killed . Pilot Sgt. S.C. Moss, navigator Sgt. R.A. Wagner, WO/AG Sgt. J.A.Wallis, AG Sgt. F.C. Lindsay made POW. Venneear † WO/AG Sgt. M.L.V. Hass †. Pilot F/S B.M. Harvey †, observator W/O B.Marrows †, WO/AG Sgt. J.B.A. MacPherson † WO/AG Sgt. F.Proctor †. 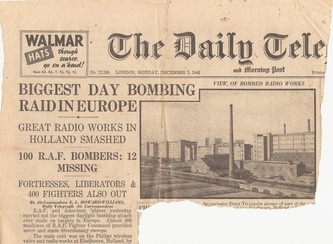 Despite the precision of the release of bombs, there were regrettably among the population of Eindhoven 148 victims. 7 German soldiers were also killed, they are buried in the military cemetery of Ysselsteyn Limburg.